Although Orlando, Florida, is known as “The Vacation Capital of the World,” many Central Florida visitors never travel beyond the area’s world-class theme parks. In fact, the Orlando area boasts many inexpensive hidden treasures that serve as fun-filled alternatives to Walt Disney World Resort, Universal Orlando Resort and SeaWorld Orlando, whether you and your family want to explore some of the area’s classic attractions such wildlife preserves and gardens, interactive museums and science centers, or abundant outdoor recreation opportunities. There’s something for everyone in Orlando! Several classic Central Florida attractions have stood the test of time and continue to attract new generations of visitors at a fraction of the price for theme park tickets. For instance, Gatorland is a 110-acre wildlife preserve and theme park that first opened its doors as a roadside attraction in 1949 and today features fascinating live shows such as the world-famous Gator Jumparoo and Jungle Crocs of the World. Known as the “Alligator Capital of the World,” Gatorland also offers reptile habitats, a nature walk, boardwalk, aviary, petting zoo, train ride and more. Gatorland is located on Highway 441 just North of the Orlando-Kissimmee line. 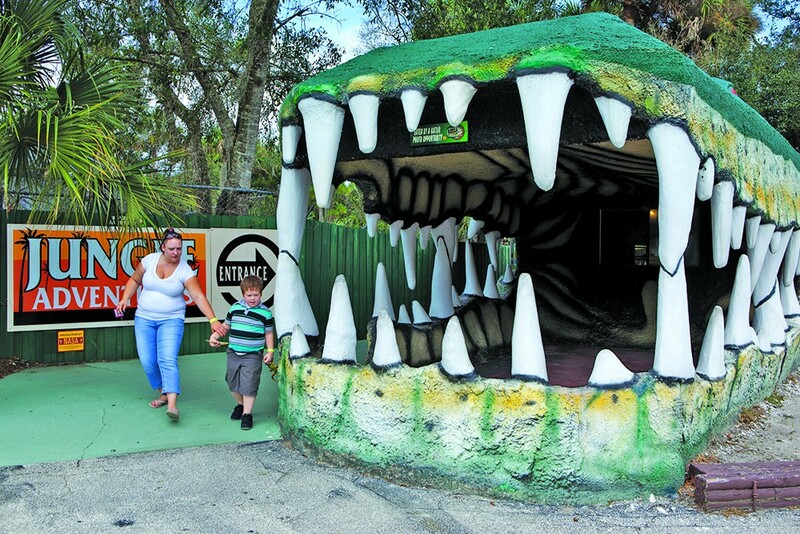 Another classic roadside attraction, Jungle Adventures, first opened in the 1960s as Gator Jungle. A 20-acre wildlife sanctuary, Jungle Adventures offers live wildlife shows, animal habitats, a Native American Village and jungle cruise. Jungle Adventures lies along East State Road 50 approximately 17 miles East of Orlando in the town of Christmas. Near downtown Orlando lies another gem, the beautiful Harry P. Leu Gardens, which were donated to the City of Orlando in 1961. The Harry P. Leu Gardens at 1920 North Forest Avenue feature Florida’s largest formal rose garden and the country’s largest collection of Camellias, as well as 50 acres of tropical plants and ancient oaks. Listed on the National Register of Historic Places, the restored 19th-century Leu home is now a museum. The Orlando Museum of Art, which is located in beautiful Loch Haven Park, houses a fine collection of American art, African art and art of the ancient Americas. The nearbyOrlando Science Center contains more than 200,000 square feet of fun-filled interactive programs and hands-on activities that will appeal to kids and adults alike, as well as the eight-story-tall Dr. Phillips Cinedome, Crosby Observatory and full-service café. Florida’s only folk art museum, The Mennello Museum of American Folk Art, features the works of renowned folk artist Earl Cunningham and other highly talented folk artists, as well as traveling exhibitions, a museum store and a wonderful outdoor sculpture garden. Watch Central Florida History come alive through fascinating interactive presentations and hands-on exhibits at the Orange County Regional History Center, which lies in downtown Orlando. Other area museums worth visiting include Albin Polasek Museum & Sculpture Gardens, Cornell Fine Arts Museum and The Charles Hosmer Morse Museum of American Art, all of which are located in Winter Park. A popular destination in the heart of downtown Orlando, Lake Eola Park offers swan-shaped paddle boat rentals, walking/jogging path, picnic tables, amphitheater and a playground. Another local favorite, the 300-acre Bill Frederick Park at Turkey Lake, features boat rentals, nature trails, an outdoor pool, picnic areas and barbecue facilities. Nestled at the headwaters of the Wekiva River, Wekiwa Springs State Parkprovides a cool spring for swimming, boat rentals, hiking trails and picnic areas. Managed by The Nature Conservancy, the 12,000-acre Disney Wilderness Preserveborders scenic Lake Russell and provides a great locale for wildlife viewing, along with a one-mile hiking trail to the lake. The preserve, which protects the headwaters of the Everglades ecosystem, provides a home to bald eagles, sandhill cranes, gopher tortoises, Florida scrub-jays other other wildlife. Nature buffs will also love the Tibet-Butler Preserve, which offers miles of hiking trails and the Vera Carter Environmental Center. Just a little over an hour from Orlando lies Canaveral National Seashore, on of the 10 National Seashores in the United States, which offers a variety of recreational activities such as sunbathing, swimming, surfing, boating, lagoon and surf fishing, hiking, horseback riding and backcountry camping. If you are seeking spacious and affordable accommodations during your next Orlando vacation getaway, look no farther than Westgate Resorts.